On Tuesday 13 January were released the results of a citizen consultation about ISDS in trade deal TTIP by the European Commission. 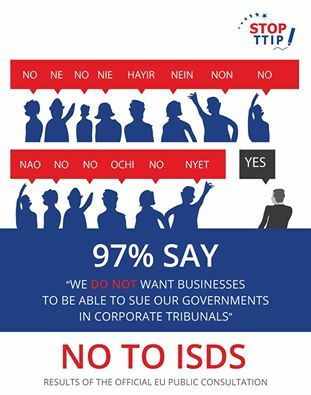 The results are clear: people do not want ISDS. The acronym stands for Investor-State Dispute Settlement and it is one of the most controversial aspects of the Transatlantic Trade and Investment Partnership because it would allow investors – companies – to sue governments for adopted reforms that threaten their profit. ISDS are not new, they are in most trade deals signed around the world. According to the results of the consultation, 97% of the almost 150,000 people who answered the questionnaire have a negative view on ISDS. That’s not surprising when we know that the ISDS clause is only there to protect investors’ interests and not that of the people. Think tank European Corporate Observatory describes perfectly how dangerous and illegitimate those clauses are. 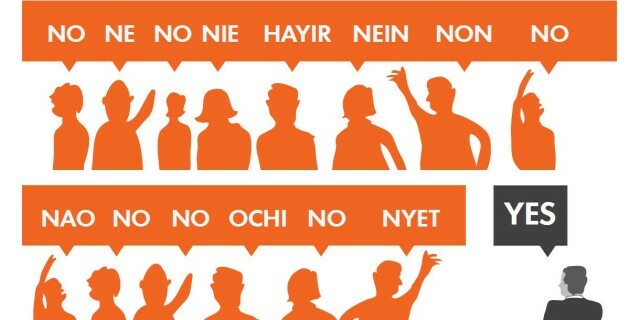 Seizing the opportunity presented by this large-scale rejection, Stop TTIP, the European alliance strong of more than 340 organisations, released a press statement (in Swedish) to highlight the fact that people understood the threat to democracy caused by ISDS, and therefore reject it. The European Commission wrote its own press release (in Swedish) where, understanding that people are not easily fooled, it wants to remind us “that the TTIP that the European Commission will negotiate and present for ratification will be an agreement that is good for citizens”. Whether or not we believe that is irrelevant. What really matters now is what the European Commission will do about such a massive negative response. Will it listen to the population or will it try to impose this whole thing on us? You too should join the Stop TTIP campaign and sign the petition if you haven’t done it yet.